Higher flow rate and larger tank capacity than the original CF90 Quantum. 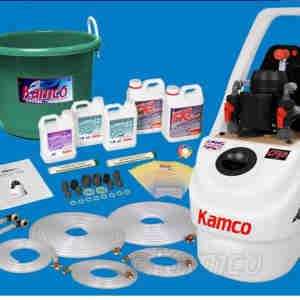 Cleans systems up to 40 radiators (3 storeys). Integral tank handle for greater toughness. Protects from impact damage and won't corrode. Larger diameter filler cap for easier addition of chemicals. Three-port valves for easier dumping operation. Improved tank shape gives greater stability, particularly when in a vehicle. Large diameter 200mm stair wheels to make it easy to move, even when full of water. Acid-proof: descales combination boilers, water heaters and other equipment.